As temperatures drop, we all try to keep warm. Well, guess what? Our pets do too! Even though many pets are covered in fur, they are not immune to the cold; in fact, pets shiver to show they are cold, just like people. 1.) Dress for the occasion: Some breeds, like Alaskan Malamutes, or Siberian Huskies have thick winter coats that help provide insulation from the cold. However, for some animals, clothing can help them stay warm in the winter, especially those that are small with little body mass, or those with short or thin fur. Sweaters and jackets made specifically for pets can be helpful, and some pets will also tolerate booties made specifically for their paws. 2.) Take it inside: Provide pets shelter from wet, drafty and cold weather. The shelter doesn’t have to be fancy, just provide a barricade from the worst of winter while the pet is outside. When he gets cold or wet, his body temperature drops, internal organs can shut down and your dog can be at risk of dying even though temperatures are above freezing. Access to an insulated doghouse, garage or shed when temperatures drop below 45 degrees Fahrenheit helps keep your dog warm. Dogs accustomed to indoor living or temperate climates should not be left outside in freezing temperatures. For those neighborhood cats who might be lost or stuck outside, building an outdoor, insulated cat box is a nice way to keep them safe, warm and secure. Simple instructions on how to make outdoor cat boxes, like those found at the American Humane Society website, allow you to protect neighborhood furry friends at a low cost. 3.) Let it grow: A pet’s fur may need to be kept longer and thicker during the winter months. Don’t let pets outside after bathing them until the animal is completely dry. Pet owners should pay attention to a pet’s feet to look out for cracks and cuts on the paw pads. Products like Pad-Tough or Musher’s Secret may help protect sensitive feet from ice and rough pavement. Also, if you use salt on your driveways and sidewalks, try the brand Safe Paw Ice Melt. 4.) Look out for winter illnesses and injuries: Frostbite, respiratory infections and consumption of toxic substances (such as de-icer, antifreeze, and melting salt) are all dangers pets are susceptible to in the winter. Running out of car fluids like antifreeze or windshield washer fluid is common during the winter months. These chemicals, especially antifreeze, are potentially deadly to animals, according to the American Humane Society. And, to make matters worse, dogs often like the taste of antifreeze! Be sure to keep pets out of the garage or away from these chemicals at all times to keep them safe. If you notice your dog isn’t behaving normally or appears to be in pain, you should seek veterinary care immediately. 5.) 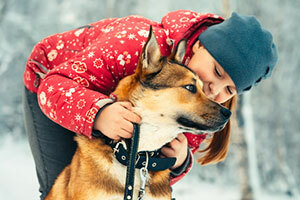 Keep them active: Dogs and some cats can get “cabin fever” too! Pets who are used to running around outside when it is warm outside might need to get more of their activity inside. Hide toys or treats for your pet to find around your house, play a modified game of catch, or have them walk or run up and down stairs. Treat dispensing toys like Kongs are great tools for burning off some restless energy. Be sure to spend some time exercising their brains too; brush up on basic training, teach some new tricks, or sign up for a class at places like Doggie Depot or Narnia. Indoor swimming for your dog can be found at See Spot Swim or Fountain of Woof in Glen Ellyn. • your dog may look uncomfortable or seem anxious. Instead of running around outside joyfully, your dog may stand around, try to turn back for home, or seek a spot that provides shelter such as under a car. • your dog may display a hunched posture with tail tucked, or lift his or her paws uncomfortably off the ground. • listen for verbal clues such as whining or barking. • symptoms of life-threatening hypothermia include weakness, lethargy, muscle stiffness and slowed breathing. Unfortunately, Punxsutawney Phil ascertained that we have 6 more weeks of winter. I’m choosing to believe the rising superstar Staten Island Chuck; he predicted was that spring is right around the corner! Happy Valentine’s Day and stay toasty!